The project displays evidentiary documents sourced from the archives of the International Criminal Tribunal for the former Yugoslavia now comprised of 9.3 million objects, including videos, audio recordings, photographs, aerial footage, X-rays, diagrams, floor plans, models, maps and even remnants of charred timber and stone. Specifically it examines the issues that emerge when material evidence is reprocessed by the legal machine that is the international court. What happens when media and other non-textual evidence enter into legal proceedings as a ‘’material witness’’ entrusted with the task of testifying to history? Which impact does the court’s processing of media materials have upon their evidentiary capacity to produce the truth claims that are required for “the justice of law” to answer to “the injustices of war”. Description: 28 sequences incorporated into a 16-channel video installation with 2-channel audio. 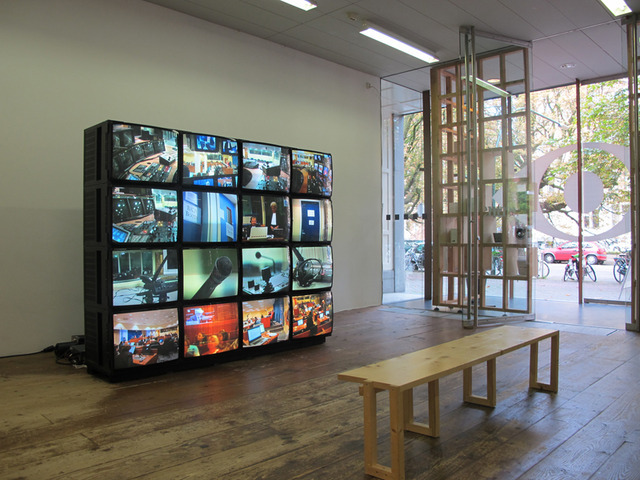 Presented as a video-wall using 28″ purpose-built Hantarex monitors dating to 1990. Overall length 120 mins.